Since I mentioned Yang Yinliu’s groundbreaking work on the Zhihua temple, he too richly deserves a tribute. Indeed, since soundscape is such a basic aspect of Chinese culture, his work should form a basic training for us all. Yang Yinliu 楊蔭浏 (1899–1984) is often described in mediaspeak as “the Chinese Bartók”, but Bartók should rather be described as “the Hungarian Yang Yinliu”. A fine musician and fieldworker, erudite historian, and incidentally a Protestant, Yang’s whole oeuvre was remarkable. Brought up in the final years of the Qing dynasty in the milieu of the Daoist instrumental music and the refined Kunqu vocal dramas of the Wuxi area near Shanghai, Yang was a fine exponent of qin zither, pipa and sanxian plucked lutes, and the ethereal falsetto singing of Kunqu (I haven’t yet found my copy of the precious recording from the 1920s found recently in Berlin). He learned instruments from Daoist priests (including Abing) from the age of six, joining the elite Tianyun she society. After the Japanese occupation in 1937, and through the troubled 1940s, not inclined to join the Communist base area in Yan’an, Yang moved from Nanjing to posts in Kunming and Chongqing, always continuing his research. Yang and his cousin Cao Anhe returned regularly to Wuxi, where they were engaged in a long-term project studying the music of the local Daoists. Of their two major books on the theme, their work on Shifan gu was first published in 1957, Yang’s on Shifan luogu not until 1980. In the past [?! ], Buddhists in south Jiangsu divided into two types, Chan school (chanmen) and Auxiliary school (fumen). Those of the Chan school were completely vegetarian, and didn’t have families. They only used percussion like woodblock, bowl, nao and bo cymbals, and tonggu drum to punctuate their vocal liturgy; they didn’t play any melodic instrumental pieces. They never took part in production, living in their temples, some of which had large estates. The Auxiliary school ate meat and had families. Few in number, they lived scattered in the villages, taking part in agriculture and only reciting the scriptures and litanies as an auxiliary occupation. Among the Buddhists, they are the only ones who play the fanyin [melodic instrumental repertoire] and [separate] percussion items. Among the Daoists, the Complete Perfection (Quanzhen) school (belonging to the Qingchengshan style of Sichuan) were similar to the Buddhist Chan school, not using separate percussion items or silk-and-bamboo instruments. Those who played the fanyin and separate percussion items mostly belonged to the Zhang Heavenly Masters school of Longhushan in Jiangxi. Among the latter group, there was a further clear class distinction. A minority of abbots possessed ritual titles of the Zhang Heavenly Masters, like “Master who Guard the Way” (daoweishi) or “Ritual Master” (fashi), and mostly owned land. They didn’t take part in production. They interacted with landlords and the bourgeoisie in the cities and villages, taking ritual work and contacting and hiring the common village Daoists to take part in major rituals (daochang fashi). These common Daoists mostly took part in agricultural production, being hired ad hoc: performing for rituals was an auxiliary occupation for them. In both agriculture and Daoism, they were an exploited class. These common Daoists—even the indispensable drummers and flute players, with their excellent musical technique—only got a tiny wage for a whole day’s work. Conversely, the “Masters who Guard the Way” and “Ritual Masters”, having only taken responsibility for quite brief ritual segments of a few hours like Issuing the Talismans (fafu), Reporting the Memorial (zoubiao), and Flaming Mouth (yankou), claimed a reward many times higher than that of the others. Those who played music were mostly the common semi-peasant Daoists; very few of the “Masters who Guard the Way” and “Ritual Masters” could do so. This shows that in the past it was agricultural life that produced and developed music. After the 1949 “Liberation” Yang’s erudition was much needed. Managing to adapt to the new Communist regime, he arrived in Beijing to become director of the newly-formed National Music Research Institute of the Central Conservatory of Music (predecessor of the Music Research Institute [MRI] of the Chinese Academy of Arts), beginning a golden age for research there. Under his committed guidance they accumulated a large archive of field recordings and traditional notations. A qin player himself, he was closely involved with all his eminent colleagues’ research on qin. 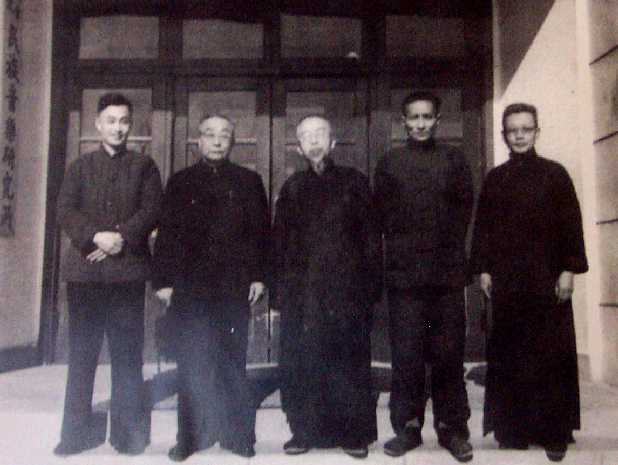 Yang Yinliu, Pu Xuezhai, Zha Fuxi, Li Yuanqing. The MRI was given a new building (typically, soon dilapidated) in Dongzhimenwai in the northeast of the city. Even in the 1980s, when it became my home base between field trips, its bare dingy corridors were animated by the spirits of the old masters. The new compound, further out in Huixinxijie, is less characterful. Yang Yinliu and Cao Anhe at the MRI, 1961. Both before and after Liberation, until the early 1960s, in collaboration with other fine scholars—notably his cousin and lifelong companion Cao Anhe (1905-2004)—Yang managed both to perform remarkable research on a range of living traditions and to compile major collections and transcriptions of traditional notation. Just as important was his monumental history, first in draft from 1944, covering with unique erudition the whole of Chinese music history, and elite as well as folk genres, albeit couched in the language of its time. His most renowned recording—on another trip home to Wuxi in summer 1950—of pipa and erhu solos by the blind beggar Abing, is perhaps his least interesting. Abing was once among the Daoists whose company Yang kept in his youth, but the 1950 recording was a casual event, on a day off from working with the Daoists who were his main focus. His work on the Zhihua temple followed on from his 1952 monograph (with Cao Anhe) of the “Songs for Winds” band from Ziwei village in Hebei during their 1950 visit to Tianjin—a band still active when Xue Yibing and I visited them from 1989. In summer 1953 Yang made an important visit to Xi’an to investigate the music (and scores) of local ritual groups; and he drew attention to the ritual music of Shanxi, notably the Buddhist mountains of Wutaishan—also later to become major scholarly themes in China. With Cao Anhe and Jian Qihua he also took part in a project to transnotate a rare score of the “suite plucking” repertoire of old Beijing. For more evidence of his good taste, see here. Along with his historical research, Yang Yinliu did all kinds of fieldwork. Just as remarkable as his studies with the Wuxi Daoists was a major fieldwork trip he led to Hunan province in 1956, amidst escalating collectivization. There Yang Yinliu headed a team documenting all kinds of ceremonial music-making, notably ritual and customary musics. Despite the politically correct language of the published volume, they seem to have taken what they found. The resulting “Report on a survey of the musics of Hunan” (Hunan yinyue pucha baogao, 1960) has 618 pages, besides separate mimeographs on Confucian and Buddhist ritual. I’ve written about it at greater length here. In the row behind, fifth from left is the trusty Li Wenru (for whom, see here). Source: Yang Yinliu jinian wenji. As the Cultural Revolution broke out, even in the Hebei village camp where Yang and others were sent for “re-education” he furtively continued research, including studies (along with Huang Xiangpeng, another distinguished colleague) of the 1972 excavation of the Han tombs at Mawangdui (see e.g. Micic, p.104). During this period Yang’s colleagues members of the elite qin fraternity were also given permission to continue their studies. Within the confines of the day, Yang Yinliu paid just as much attention to “literati” and “religious” culture as to more popular genres (pace Joseph Lam). Indeed, Yang was perhaps predisposed to studying early music history; and it wasn’t so much post-Liberation ideology that drew him to popular living genres, but his own training in performance (Kunqu, Daoists and so on). he discusses Yang’s own article “Ruhe duidai woguode zongjiao yinyue” 如何对待我国的宗教音乐 [How to assess religious music], Wenhui bao 1961.3 (also reproduced in the 2013 Yang Yinliu jinian wenji), written just as a very brief lull in extreme leftist policies followed the climb-down after the terrible famine. Meanwhile scholars had been discussing the classification of genres; their framework was enshrined in the 1964 Minzu yinyue gailun [Survey of Chinese music]. Despite the separate and subsidiary place of “religious music”, they were aware that ritual practice pervaded all genres of rural performance. Indeed, Yang seems to have been the first to use the term “ritual music” (yishi yinyue ) in China. From 1959 he also spent many years revising his masterwork Zhongguo gudai yinyue shi gao [Draft history of Chinese music], which was finally published in 1981. Covering literati, palace, folk, and religious traditions required him to take great care over how to couch his language. So in his 1961 article he was subtly, and boldly, justifying the very need to study ritual traditions, using the language of class struggle while attempting to refine it. It will hardly satisfy modern anthropologists of religion; indeed, it makes a rather severe test of our ability to interpret writings of the time. Of course, in the 1950s the tenets of ethnomusicology were still far from common even in the West. Yang’s use of language shows the hoops that scholars had to jump through in order to get on with documenting the diverse genres. After the downfall of the Gang of Four in 1976 and the demise of the commune system, Yang Yinliu finally saw his great history formally published, and cultural and academic life restored. Though he lived long enough to witness the revival of tradition, he could hardly have imagined how widespread it would become, and how important the study of ritual and its soundscape was to be. How he would have delighted in the renewed energy of the Anthology and later fieldwork projects! His interests may have been more directed towards the “salvage” of genres common in his own youth and throughout imperial history, but I think he would have understood the value of documenting their fortunes since Liberation, even if that was still to remain a sensitive subject. I was most moved to hear the Beijing Protestant Church Choir sing it at a memorial concert for Yang in November 1999. His Christian background has long been recognized, but only with the liberalizations since his death did it become possible in China to admit, sotto voce, that he remained a Christian all his life. This makes his hymns all the more moving, especially bearing in mind all the silent tribulations since the 1940s of Chinese Christians, along with artists, intellectuals, and peasants. Along with my Chinese friends, some of whom were his pupils, I can’t help feeling a deep nostalgia for the golden days of the MRI. Yang Yinliu’s combination of encyclopedic knowledge and musicianship are likely to remain unmatched. If only my other great mentor, Laurence Picken, had been able to confer with him! Like many ethnomusicologists, I no longer want to be limited by the narrow association with “music”, but while Yang Yinliu’s writings are wide-ranging as well as profound, his focus on “music” was also admirable. With two distinguished successors of Yang Yinliu at the MRI, 1989: Huang Xiangpeng (left) and Qiao Jianzhong. Alas, I arrived in Beijing in 1986 a couple of years too late to pay homage to Yang Yinliu in person. But his spirit animates us all. Peter Micic, “Gathering a nation’s music: a life of Yang Yinliu”, in Lives in Chinese music, ed. Helen Rees (University of Illinois Press, 2009), pp.91–116. Note also references. Sunan chuidaqu, 1957 edition, pp.11–12. This passage was cut from the 1982 edition. There may be a story to tell here: perhaps such material was still more sensitive when they revised the text around 1980 than it had been even in 1957. See also Meng Fanyu 孟凡玉, “Lun Yang Yinliude yishi yinyue yanjiu” 论杨荫浏的仪式音乐研究, Yinyue yishu 2017.6. For a simple introduction to the musical and ritual culture of south Jiangsu, see my Folk music of China, pp.246–8. Cited in Micic, “Gathering a nation’s music”, pp.105–106. This entry was posted in China, Daoism, fieldwork, gender, language, ritual, Taoism, tributes and tagged Beijing, Buddhism, Hebei, Shanxi (other), south China, Yang Yinliu. Bookmark the permalink. Hey Stephen. Love this piece on Yang Yinliu. It brings back so many memories of my efforts to write a biographical sketch of this Titan in “Lives in Chinese Music” (2009). Btw, I love your site. Keep writing:-) Oh, yes, I also wrote a bio on Huang Xiangpeng. If you want to read it, I will send you a copy. Best wishes, Peter. Good to hear from you Peter, and thanks. I guess you saw I cited your 2009 chapter in my Selected Resources in this post. Indeed, worth celebrating Huang laoshi too. I love writing biographies. Just today I was listening to the guqin master 吴兆基. I found an interview in Chinese online and will translate and edit over the coming weeks. Good article, thanks. Good to see it here too. And did you see my nice photo of Wu Zhaoji listening to Lin Youren in my tribute to the latter? There are the Hugo CDs Wumen qin music, of course, and doubtless more online. Try John Thompson’s site?